visible one in 1c is the same as 1d). Figs. 1, 2. Rhopalastrum mülleri. 28B(II). Fig. 1. Fully developed specimen, with overview in fig. la, and details of the brachial and patagial structures in figs. 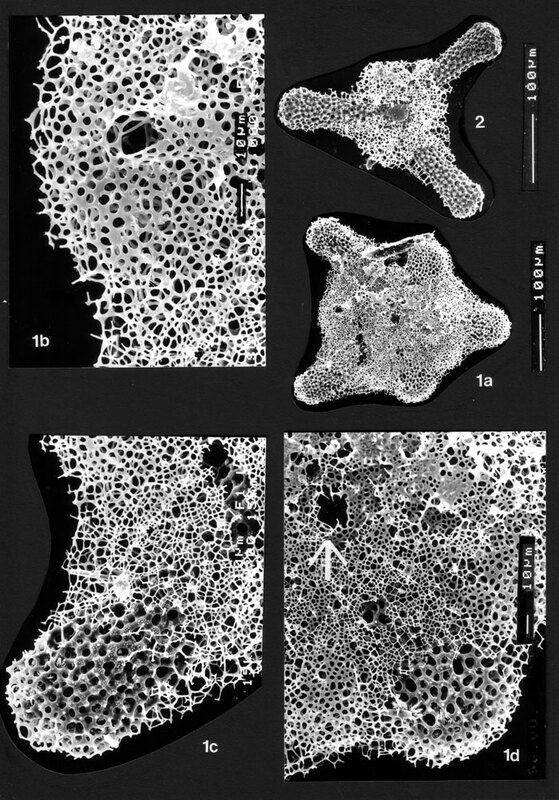 lb-d. Morphology of the patagial pores varies from circular to rectangular. Heavy silicification of the patagium (detail at lower right in fig 1d) results in armlike structures at both sides of the lone arm (a feature which clearly distinguishes this patagium from those of Rhopalastrum elegans and Hymeniastrum euclidis). Fig. lb shows a detail of the pylome (possibly exit of a flagellum? ); fig. 1c of the strawberry-like ornamentation of brachial nodal points, and fig. 1d shows the smooth, poreless plate covering the central structure (arrow; see also pl. 48). Fig. 2. Incomplete specimen. Note rough, strawberry-like outer surface of arms and smooth, flat pore-plate in the center.